Free the man in the phone! Imagine you’re FaceTiming with your dad. But instead of seeing his face trapped in a two-D screen, his image is free-floating in the air – in three-D! Sounds like a sci-fi movie, right? Maybe not for long! Daniel Smalley from Brigham Young University brought this fantasy one step closer to reality. He and his colleagues beamed an image onto the air over a fingertip…. It was five times SHARPER than a printed photo! And the setup is simple: no display board, no special glasses. How do they do it? 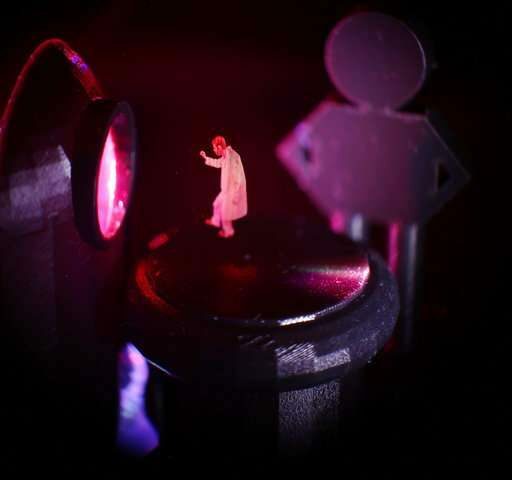 First, they use an INVISIBLE laser beam to trap a particle mid-air. Then, they move the laser beam to draw out an object. Finally, the particle’s path was lit up with VISIBLE lasers! It’s like drawing your name at night with a sparkler… If the particle is moving fast enough, your brain sees it as one picture! So next time you call, let’s talk face to face — in a three-D world!